With a motto like Fluid thinking.™, it's no surprise that TI Automotive plans to make a splash in the automotive aftermarket. "Fluid thinking.™ shapes the mindset of TI Automotive," states the company, which was founded as Bundy Tubing Company in Detroit in 1922 and first produced fuel lines for the iconic Ford Model-T. "Global automotive manufacturers turn to TI Automotive for insight and focus to develop award-winning automotive fluid systems technology." The next industry it hopes to change is the performance aftermarket, where it has rebranded its Walbro fuel pumps under the TI Automotive name, and gone all-in with a variety of new pump models for high-performance and racing applications. 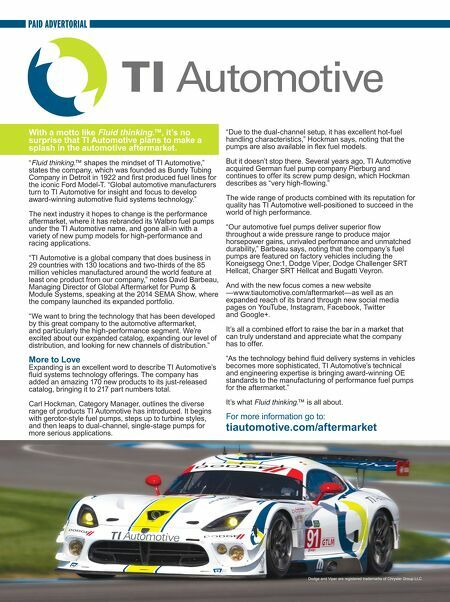 "TI Automotive is a global company that does business in 29 countries with 130 locations and two-thirds of the 85 million vehicles manufactured around the world feature at least one product from our company," notes David Barbeau, Managing Director of Global Aftermarket for Pump & Module Systems, speaking at the 2014 SEMA Show, where the company launched its expanded portfolio. "We want to bring the technology that has been developed by this great company to the automotive aftermarket, and particularly the high-performance segment. We're excited about our expanded catalog, expanding our level of distribution, and looking for new channels of distribution." More to Love Expanding is an excellent word to describe TI Automotive's fluid systems technology offerings. The company has added an amazing 170 new products to its just-released catalog, bringing it to 217 part numbers total. Carl Hockman, Category Manager, outlines the diverse range of products TI Automotive has introduced. It begins with gerotor-style fuel pumps, steps up to turbine styles, and then leaps to dual-channel, single-stage pumps for more serious applications. PAID ADVERTORIAL "Due to the dual-channel setup, it has excellent hot-fuel handling characteristics," Hockman says, noting that the pumps are also available in flex fuel models. But it doesn't stop there. Several years ago, TI Automotive acquired German fuel pump company Pierburg and continues to offer its screw pump design, which Hockman describes as "very high-flowing." The wide range of products combined with its reputation for quality has TI Automotive well-positioned to succeed in the world of high performance. "Our automotive fuel pumps deliver superior flow throughout a wide pressure range to produce major horsepower gains, unrivaled performance and unmatched durability," Barbeau says, noting that the company's fuel pumps are featured on factory vehicles including the Koneigsegg One:1, Dodge Viper, Dodge Challenger SRT Hellcat, Charger SRT Hellcat and Bugatti Veyron. And with the new focus comes a new website —www.tiautomotive.com/aftermarket—as well as an expanded reach of its brand through new social media pages on YouTube, Instagram, Facebook, Twitter and Google+. It's all a combined effort to raise the bar in a market that can truly understand and appreciate what the company has to offer. 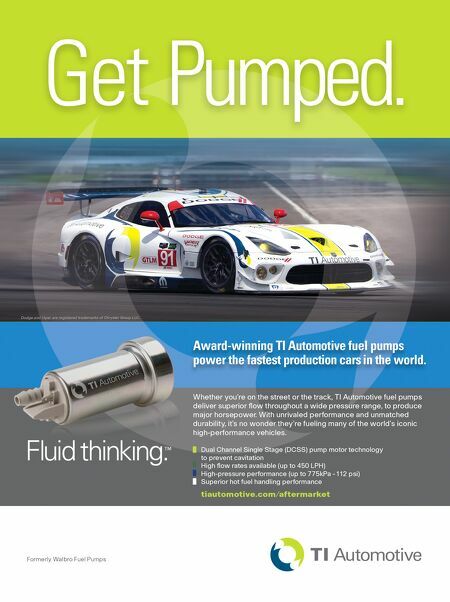 "As the technology behind fluid delivery systems in vehicles becomes more sophisticated, TI Automotive's technical and engineering expertise is bringing award-winning OE standards to the manufacturing of performance fuel pumps for the aftermarket." It's what Fluid thinking.™ is all about. For more information go to: tiautomotive.com/aftermarket Dodge and Viper are registered trademarks of Chrysler Group LLC.